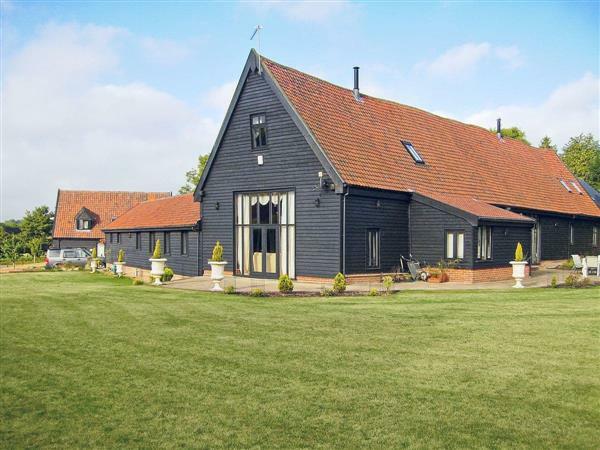 Doves Barn in Badley, near Needham Market, Suffolk sleeps 22 people. Doves Barn near Needham Market dates back to the 16th century and is a detached, Grade II listed barn, brimming with charm and character. Boasting original oak beams and timeless charm, yet perfectly mixed with modern day comforts. There is a vaulted ceiling criss-crossed with exposed beams in the living room, and the large inglenooks with wood burners to provide the warmest of invites. There are eight bedrooms in total, including two galleried bedrooms with king-size beds. With plenty of space for guests to celebrate a special occasion, and yet still have the opportunity to enjoy the escape from everyday life pressures, and simply sit back and relax in the peaceful surroundings. Nestled within two acres of extensive grounds, Doves Barn offers spacious accommodation that is well furnished for comfort and enjoyment. Relax and enjoy your own six person hot tub and a large courtyard garden with a choice of two patios, great for those al fresco dining opportunities. Whatever the season, Doves Barn will provide you and your guests with the warmest of welcomes. This is a great location that is close to all the necessary amenities and an excellent base to explore the rolling countryside and unspoilt coastline. The area offers good bird watching, walking, and cycling opportunities. Needham Market is just 1 mile away, a pretty small town, rich with its historic roots in the wool industry. Bury St. Edmunds is 19 miles away and is a shoppers’ paradise with an abundance of shops in the picturesque medieval streets, and elegant Georgian squares along with award-winning restaurants, fantastic annual festivals, family entertainment, stunning parks, cafés and a Georgian theatre. Ipswich is 12 miles away with its town centre and pretty harbour. There are local train links to London and Bury St. Edmunds. Visit Suffolk’s stunning Heritage Coast which includes the popular seaside town of Aldeburgh with its great choice of eating establishments and shops, the intriguing village of Dunwich, a peaceful haven for wildlife with its beautiful heathland and the popular coastal town of Southwold, the home to Adnams Brewery, with pubs, galleries, shops, lighthouse and beach huts. The beach is 29 miles from Doves Barn near Needham Market. With the shop, pub and restaurant 1 mile from Doves Barn. Doves Barn has 3 steps to the entrance. Bedroom 5: With king-size bed and en-suite with shower cubicle and toilet. Bedroom 6: Galleried with king-size bed and single bed. Bedroom 7: With four poster king-size bed, beams and en-suite with shower cubicle and toilet. Oil central heating, electricity, bed linen and Wi-Fi included. Cot, travel cot and 2 highchairs available on request. Welcome pack. Large lawned garden with sitting-out area and garden furniture. Hot tub for 6 (private, open until 9pm). Private parking for 10 cars. No smoking. Please note: There is an unfenced pond in the grounds, 45 yards away. Fireworks are not allowed in the garden. Couples and family bookings only, no stag or hen parties. For a better idea of where Doves Barn is, you can see Doves Barn on the map below. Doves Barn is in Suffolk; should you be on the lookout for a special offer, you can find all the special offers in Suffolk. It's always worth checking to see what is on offer at the moment. Do you want to holiday near Doves Barn (UKC2573), you can see other cottages within 25 miles of Doves Barn; have a look to find your perfect holiday location.